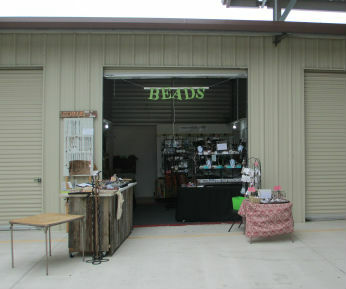 Take a quick look at the bead and jewelry store at space 1057 in Traders Village – San Antonio. I am now going to put each of the images in this post for those of you who do not like sliders. 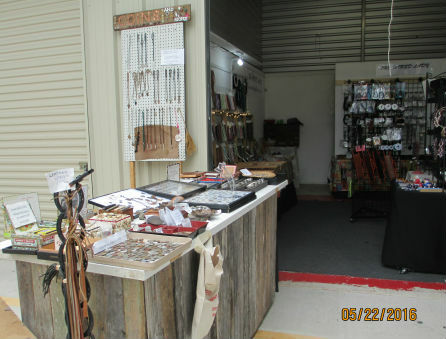 Here is the view of the bead and jewelry store that you will normally see when you walk down 10 the street. Ed sets up his “traveling” cart on the left side and I put some odds and ends on the right side. 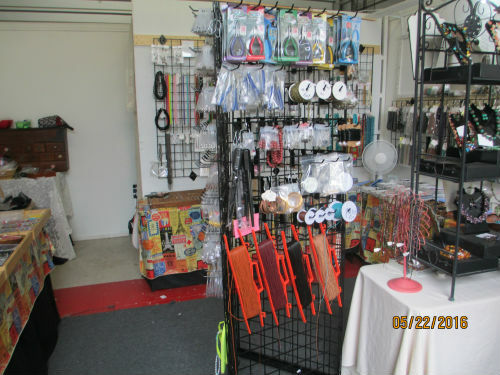 Usually the vendors on the left and right have merchandise displayed also. I took these pictures on Sunday before the flea market “officially” opened. 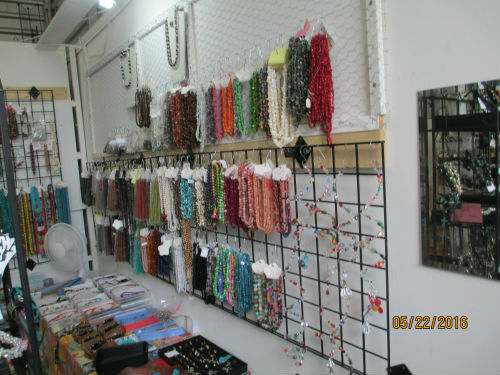 As walk down the left of the store you will see glass crystals, glass pearls, crackle glass beads, and lots and lots of charms. I used my “traveling” display cases to show my crystals, glass pearls, and crackle glass. Also, the bases of the display cases nicely contain my charms and other stuff. Above the display cases we built frames using chicken wire. I store extra strands of beads there. I also put necklaces made with some of the merchandise in that area on display. It fills up dead space and gives customers some design ideas. The area under the tables housed more charms and beads. Area along the back wall is filled with simple necklaces and chains, religious items, synthetic turquoise, and special beads from my personal stash. On the tables along the back wall I have a printers tray full of large whole spacer charms. Next to the printers rack I have several trays with larger crosses and medallions. The back wall has changed greatly since March. I replaced the wide tables with narrow tables and used old wooden printers trays and small display trays to show some items. 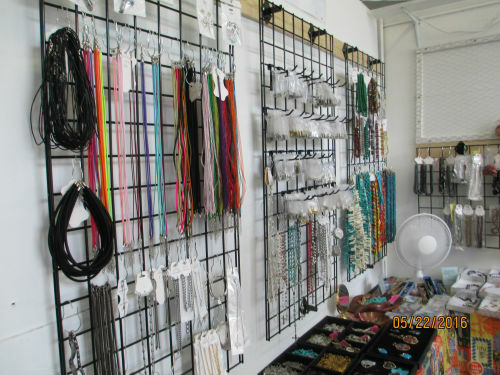 The printers tray is located directly under the grid with the ribbons and chains so customers can build a small necklace or bracelet. The middle grid houses rosary makings, religious themed spacers, and rosaries that I made and stainless steel rosaries that I did not make. Check out the right wall of the store. We have a nice assortment of semi-precious stone beads, fresh water pearls, and shell beads. Also, just for fun…. a couple of crystal sun catchers. 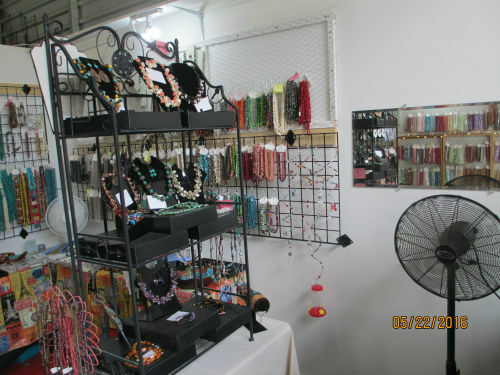 The tables along this wall are filled with $10 bracelet and necklace sets, $1 semi-precious stone rings and charm rings. I also have a small selection of $5 custom made rings and earrings that I made using an assortment of semi-precious stones. I had two 2 by 4 foot panels that I used on large tables. Originally, all of my findings were on these panels in the center of a table. In this space….they took up too much space. Also, my semiprecious stone beads were displayed on the poultry wire frames. This did not work! It was too hard to reach the beads. So I downsized to smaller tables and mounted the grids on the wall below the poultry wire frames. This has worked fabulously! My next door neighbor at the flea market sells doors and fixtures for doors. He had a 15 inch by 60 inch mirror and he gave it to me! Wow! How lucky was that. 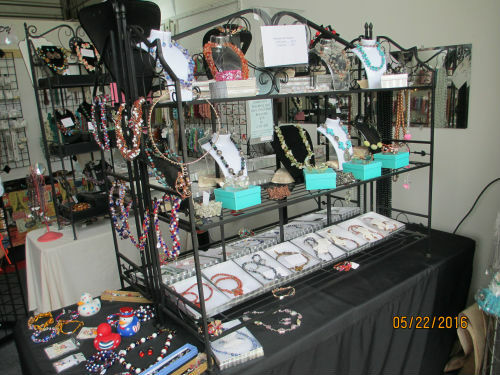 The table space is filled with an assortment of rings and $10 necklace and bracelet sets. 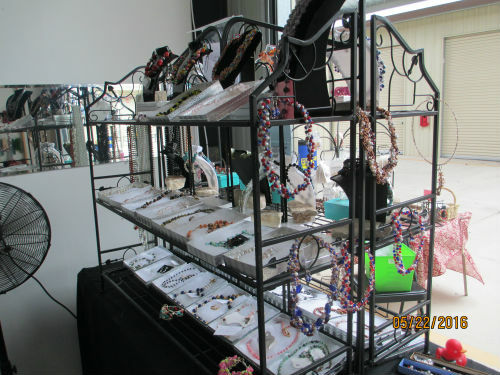 This table space changes….sometimes I display boot bracelets or other items of interest. I am working on a display with barefoot sandals and anklets for the summer. The large moving six foot table with two large bakers racks and the smaller table with one bakers rack are located in a variety of areas…..depending on what’s happening and weather. The necklaces on this bakers rack are mostly semi-precious stone necklaces. Some are simple stands while others are branched or wire-wrapped chains. Most include earrings. This table “moves” about the area….sometimes outdoors…..sometimes along right wall…..sometimes in center area. Regardless of its location …..it holds lots of my $20 items that I sell. Usually I will display my $10 leather items on the edges. Sometimes I put displays on both sides and angle the table where it is half outside and half inside. All depends on weather and how I feel. 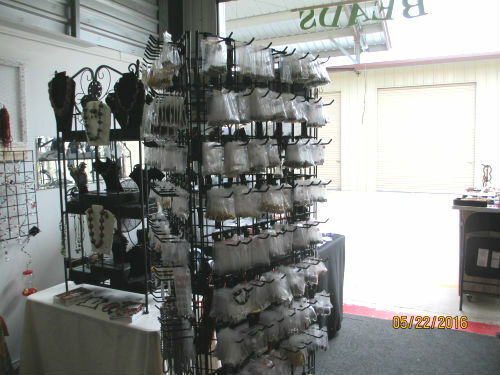 Items on these two racks are necklaces or bracelets that I have made. These are my $20 items. Usually, I try to display my leather work and/or a themed display on the sides of the bakers shelves. For the last couple of weeks I had my leatherwork on one side and the opposite side I displayed three styles of Spurs bracelets. 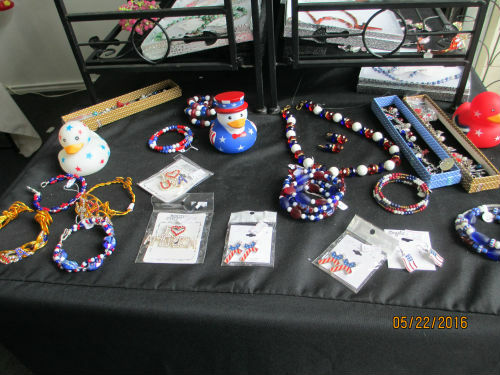 Currently, I have items made with red-white-blue for Memorial Day and 4th of July. The side items change about every two weeks. I have some really cool leather bracelets that I am enhancing and I hope to have a Father’s Day display soon. I have made some with a western flair. I have crocheted some. I also was able to make some awesome semi-precious stone cross necklaces. The bracelets are single crocheted wire bracelets or braided wire bracelets. I like doing a variety of styles. The other side has several semi-precious faceted+graduated stone necklaces. I also make branched necklaces using semi-precious stone chips. They are lots of fun to make. I have a short table that holds a small bakers rack. I usually place it perpendicular to open space on the right wall. There I place my different wire work. The display of necklaces changes frequently….depending on my mood. I also like to show a variety of styles that will reflect the type of work that I do. More expensive items displayed on tall bakers rack or sometimes on acrylic risers. Sometimes this table is out in the middle of my space…sometimes it is perpendicular to the right wall next to the mirror. Sometimes it is at the entrance. Placement varies. Also my displays vary. I try to show the various styles of wirework that I do. These items are priced between $30 and $75 depending on materials and time spent creating. Ed built a rolling display area for his items. He sells a diverse set of wares: coins of the world, steel pennies, arrowheads, old OLD coins, necklaces made from gun shells, and more! My friend, Ed, sells his items on this rolling cart. He has an eclectic set of wares. Old coins, shark teeth, arrow heads, crystals, necklaces made with all kinds of things and lots of other interesting things. I usually display basket, platter, and rack of earrings and bracelets that are $5 or less outside of my space. 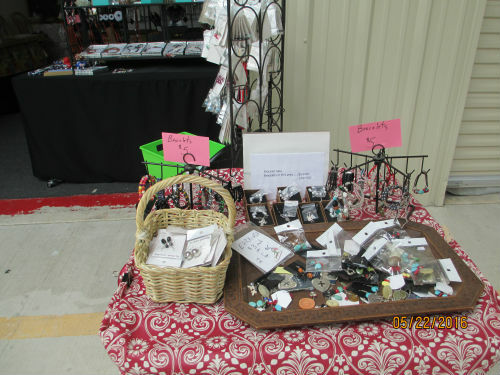 I set up a large selection of $3 earrings and $5 bracelets out in front. I also have a bargain bin….where everything is 50 cents. 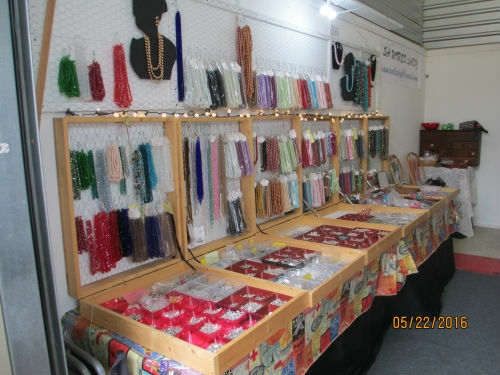 Hope you plan to come see me at space #1057 – Bead and Jewelry Store at Traders Village – San Antonio. If you like to make jewelry ……my prices are great! If you like to wear jewelry …….my prices are fantastic! 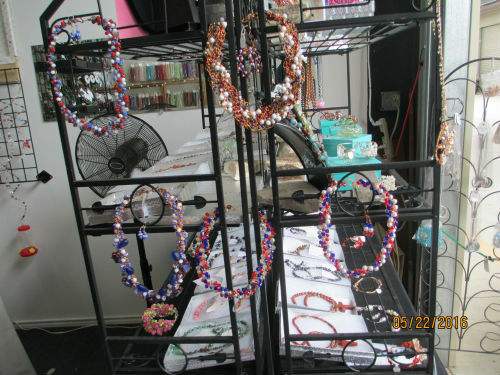 If you want to learn how to make jewelry ….stop by …..we can arrange a time when I can help you.